Babywearing education Jessica Hrehor and her daughter, Kalin, and her son, James. 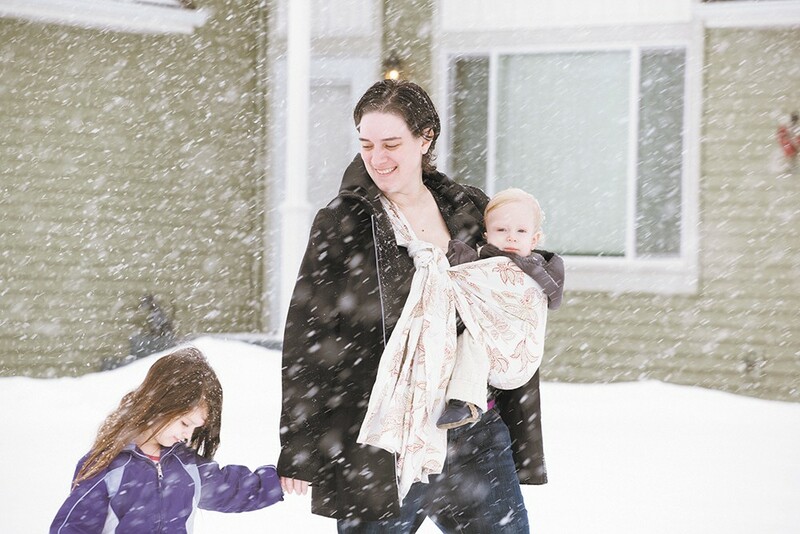 For Grace Kimball, babywearing is a powerful parenting tool. Kimball, of Coeur d'Alene, has a 2-year-old daughter, Kimber, who has special needs, and a 6-month-old son, Callahan. Her husband is out of town for work much of the time, and babywearing — the practice of holding a baby against one's body using a sling or other carrier — allows her to keep up with the demands of caring for two small children. She wears her children every day, comforting them while still accomplishing housework or running errands. "It's a very positive thing that you can do for your child, and it deserves more awareness," Kimball says. Babywearing, a centuries-old practice, is the norm in many cultures around the world; while U.S. parents often use devices such as strollers and bucket car seats instead, babywearing appears to be on the rise here, and research shows it it can provide numerous benefits. A group of pediatric providers are working on forming a section on babywearing for the American Academy of Pediatrics to craft guidelines on babywearing. Meanwhile, babywearing support groups are cropping up around the U.S. — including the Inland Northwest — bringing babywearers together and helping caregivers navigate the world of wearing. Kimball's daughter was recently diagnosed with autism, and wearing provides comfort when she gets overwhelmed, Kimball says. Wearing her son allows him to nap and nurse on the go, leaving her hands free to tend to her daughter. "He goes in the carrier and he has all his needs met, his mommy right there, and he's just along for the ride," she says. "It really, really saves me while going from appointment to appointment." She says that babywearing helps her family continue to enjoy an active lifestyle: "I don't want having kids to stop people from doing anything. If anything, it has encouraged my husband and I to get outdoors more." The benefits of babywearing go beyond convenience. Medical professionals agree that loving touch and interaction with a caregiver helps infants thrive, and babywearing is one way to promote physical, social and emotional development. "Hugs, kisses, spending time talking with them, looking at them, all types of touch and closeness can help promote bonding and development," says author and parenting expert Tanya Altmann, MD, FAAP (Fellow of the American Academy of Pediatrics). "Babywearing is definitely an easy way to help facilitate closeness with your baby." Evidence shows babywearing is associated with reduced crying and colic — welcome news for parents. One study found babywearing mothers were more responsive to their babies' vocalizations and that those babies formed secure attachments. "There are a lot of advantages that come with babywearing," Altmann says, adding that it's also important for babies to get some floor time. "I think it's something every parent should try." Touch can help a newborn regulate physiologically. Benefits of babywearing begin with skin-to-skin contact immediately after birth for normal, stable babies, says neonatologist Raylene M. Phillips, MD, FAAP. Babies born prematurely who end up in the Neonatal Intensive Care Unit have increased needs for skin-to-skin contact for physiologic stability, improved temperature control, increased breastfeeding initiation and duration, and more mature sleep cycles, which directly support optimal brain development and improved parental-infant bonding. Babywearing "is not well known and it's not well publicized, so that's why we want to bring attention to it," Phillips says. When a mother holds her baby close, oxytocin levels are increased, aiding in bonding. That closeness also prompts the release of prolactin, the hormone needed for lactation "so that you actually end up producing more milk," says Polly Gannon, an international board-certified lactation consultant. Babies who are worn also may also spit up less, easing acid reflux, because they are in an upright position. Alex Hamling, MD, FAAP, says the section on babywearing would develop guidelines for pediatricians and other practitioners, promote research, disseminate best practices and shared knowledge, and create patient-friendly handouts on babywearing. The group of pediatric providers have submitted a proposal for the creation of the section that they hope will be voted on within the next six months. Hamling says there are lower rates of developmental hip dysplasia in countries where babywearing is more common, and one mission of the planned AAP section on babywearing will be to facilitate more research in that area. It also promotes neural development due to the wearer's movements and reduces positional plagiocephaly, or "flat head syndrome," he says. Hamling, who wears his own 18-month-old daughter, says he is passionate about babywearing "both personally and professionally." "It's been a really great way for me to connect with my daughter at a young age," he says. "I think it's just a great way parents can recognize cues quicker in their child." Babywearing can be done as long as mutually enjoyed — even into toddlerhood and beyond. There are many styles of carriers parents can choose from, including ring slings, soft-structure or buckle carriers, woven wraps, stretchy wraps, pouch slings, mei teis and more. Prices can vary drastically, with new carriers starting as low as about $30. Two groups, Babywearing International of the Inland Northwest and Spokane Babywearing, have meetups to help parents find a carrier that's right for them and get a safe and comfortable fit. BWI of the Inland Northwest has a lending library for parents to check out different types of carriers. "The best thing to do is go to a meeting if you can, because you can touch and feel and see all the different types of carriers that are available, and really get a good idea of what is going to work best for you," says Jessica Hrehor, a local babywearing educator. "It depends on what you need, what you want and your personal preferences." Hrehor, who has demonstrated a proficiency with many types of carriers to earn her title, says that babies have a strong need to be close to their caregivers. Babywearing is one way to for babies to bond with moms, dads, grandparents or anyone else involved in a child's care. "The best way to foster independence is to meet their needs for attachment from early on," she says. Tight: The carrier should be tight enough to hold the baby snugly to your body. Slumping can hinder the baby's ability to breathe and cause back pain for the wearer. In view at all times: The baby's face should always be in view. Close enough to kiss: The baby's head should be close enough to your chin that you can easily kiss her head. Keep chin off the chest: Ensure that there is always space between your baby's chin and chest, so breathing is not restricted. Supported back: A well-fitted carrier should support the baby's neck and back. Ideally, the baby should be held with his or her knees higher than their bottom in a "M" position, with the carrier supporting them knee to knee; the knee-to-knee support isn't necessary for older babies and toddlers. Visit BWI of the Inland Northwest or Spokane Babywearing on Facebook to connect with local babywearing resources.